. . of what is to come. This is one of my images I did for the Black & White challenge this week. This blackberry is called Black Satin. Well done with the color too. It looks nice with the selective coloring Kathy. Good one for the challenge. 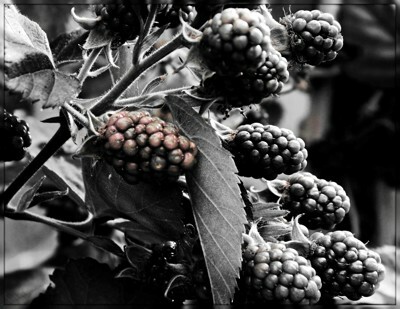 The touch of selective coloring has enhanced the beauty of this B&W still life, Kathy. A perfect entry for the BWC, my friend! Oh I love blackberries ! This is a most enticing image Kathy with just a hint of colour to suggest what is to come.